A wristlojackimator is a device worn on the wrist which has a wide variety of functions. The device itself may be called something other than "wristlojackimator", since Leela usually refers to hers either as "this thing", "this thing I wear on my wrist", "my wrist-ama-jig" or "my wrist thingy". She only refers to it as a wristlojackimator once (2ACV11), and may in fact have been referring to the tracking beacon function she was using at the time ("wristlojackimator" contains the phrase "lo-jack"—a popular anti-theft tracking device for 20th-21st century cars). Wristlojackimators may in fact have independent artificial intelligence, as Leela's detaches itself and leaves during the 3001 Robot Uprising incited by Mom on Mother's Day, and tells her she should wash her wrist more often. These multi-functional devices are operated by means of buttons and voice commands. They are available in a variety of models and colors. In one episode Leela uses a laser beam device on it to reattach Fry's nose (it also burnt his skin). It may be that it is a weapon laser, which she had set to stun, or it is simply a tool for starting fires, cutting and welding. They may have been inspired by the tricorders from Star Trek. They are similar to the Pip-Boys, devices containing text information, maps, vital signs, and more in the video game series Fallout. 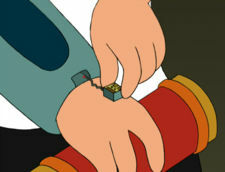 Fry in "The Why of Fry"
Leela wears the wristlojackimator in every episode of Futurama, so this list only shows when it has a special appearance, for example when a new feature is revealed, when it is mentioned by a character, has a part of the plot, or is used by a character other than Leela. - first appearance. Used as a two-way radio to communicate with the police. - used as a clock. - used for analyzing the success rate of rhyme-busting. - rebelling on Mother's Day. - used for evaluating nutritional/toxicity of food. - used by Number 1.0 as tracking beacon. - used as portable video game console playing Tetris, and as a neutron laser (the latter in a deleted scene). - used as a remote control of the Planet Express ship's cargo bay stairs. - used as a telephone. - used as a holographic diary. - used for surveying atmosphere and gravity. - used for calculating a Robot's exhaust flames efficiency. - used as a wristwatch. - used for receiving communications. - used as an Emergency Face Laser to reattach Fry's nose. 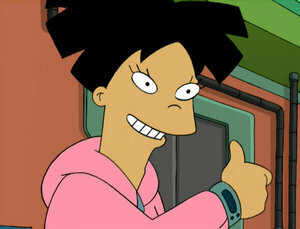 - used by Leela to check email, and by Lars Fillmore as a tissue dispenser. - used as portable video game console playing Single Pong. - used as a speed-pass to electronically pay for a fuel purchase, and later as a two-way radio, a feature already known. - used as a laser to stop the Desert Muck Leech from sucking Leela's blood, although this may be the same device as the Emergency Face Laser from "Spanish Fry". - possessed by Bender to slap Fry. - used as an Internet browser to view a video she posted online. - used as a videophone. - plays unbidden holographic, targeted-advertising commercials. - used as a GPS device. This page was last edited on 28 April 2015, at 21:53.